Annual Hot Cross Bun Ceremony in the Bell Inn at Horndon on the Hill. 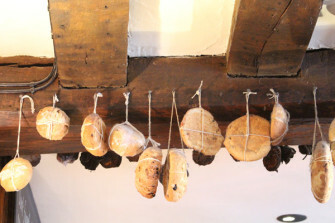 Hot Cross Buns hanging from the beams of The Bell Inn at Horndon-on-theHill. A new recording made in response to this recording already in the archive. It was a glorious day, so Damien and I took a drive out to the Bell Inn at Horndon on the Hill to see what their Hot Cross Bun Ceremony was all about. The staff were very friendly and accommodating, and the place was heaving in anticipation. I got chatting to a chap called Rod South, and he informed me that traditionally the ceremony was to be led by the eldest member of the village. As well as being an honour, it was also a bit of a wooden spoon as many of the village elders died before they could return the following year to give the ceremony again. This year it was the turn of Terry McNally, who was urged by his family to decline the honour as they wanted him to stick around longer than a year. But he agreed and after the introduction from John Vereker, the landlord, Terry informed everyone in the pub that that particular rule had been ignored this year as he was clearly a ‘spring chicken’. Terry also announced a few things that had changed since last year’s ceremony and described how the village had evolved since the 1950’s. Finally he added a new bun to the beams, the 110th!